The Smithsonian Folklife Festival takes place every summer, bringing amazing world cultural events to the National Mall! Every year has a specific theme and in 2016 they’ve been focusing on Basque, a country that spans between northern Spain and southwestern France. Doubtless the Festival has done a great job in covering many aspects of this nation. But allow me to expand on their efforts! For the last several years, inspired by our local Folklife tradition, I have researched and brought attention to the widely diverse world Jewish communities. Jewish culture has touched almost every region of the world, and of course vice versa. So let us begin. The Jewish Encyclopedia details life for the Tribe in the Basque provinces of the middle ages, when they were under Spanish jurisdiction. Jews lived in Vitoria, the capital of the province of Alvira, and in 1203 were moved to a special street called “Calle Nueva” or “New Street.” They chiefly worked as moneybrokers, though in 1332, Alfonso XI of Castille issued a decree that forbade Jews to take promissory notes from their Christian neighbors. These antisemitic decrees continued into the fifteenth century. After August 21, 1482, Jews weren’t permitted to enter the Franciscan monastery until after mass. Later in the year, Christian girls and women were permitted from entering the Jewish ghetto without male accompaniment. They were also prohibited from acting as a Shabbes goy, that is, cooking or lighting fires for Jews when they couldn’t due to Shabbat restrictions. Jews were also forbidden from working publicly or in Christian homes on Christian holidays, and Christians were forbidden to sell fruit in the ghetto, take services with or live with Jews. Finally, in 1484, Jews were forbidden from reading ecclesiastical edicts or serving as lawyers in lawsuits. All of this, of course, was leading up to the official Spanish expulsion of the Jews in 1492. On June 27 of that year, prominent Jews of Vitoria came before the city council on behalf of the Jewish community, and were granted their cemetery, “Judimendi,” (Jews’ hill) so long as they didn’t plow it. Jews left Vitoria and went to the neighboring province of Navarre and elsewhere. 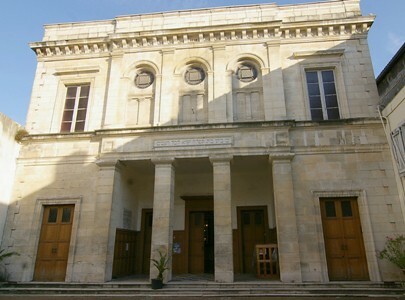 Vitoria took possession of their synagogue and turned it into a classical school. “Calle Nueva” briefly became known as “Calle de Puenta de Rey” (Kingsbridge Street.) A year later, Marranos (Christian converts who often secretly practiced Judaism) were ordered to leave this street and live among other Christians. The Encyclopedia concludes that French Jews may now inhabit Basque. According to former Bilbao resident Joaquin Carlos Caraguegguie, the Inquisition didn’t really touch Basque and Jews have always lived there quietly among their Christian neighbors. He gave an interview to Myrna Katz Frommer and Harvey Frommer of Travel-Watch, claiming there used to be 60,000 Jews in the region and now there are about 10,000. He described his post-war childhood religion as an open secret in his community, where he attended public schools taught by Jesuits and everyone knew he was Jewish. Their Jewish practice was pretty nil, but they were raised to believe that the Old Testament was “their” bible. A couple of years ago, Karen Ginsberg wrote a piece for the Jewish Independent about her travels to Basque. At the Musée Basque et de l’histoire de Bayonne, there is a special exhibit on Jews in French Bayonne since 1600, where some settled after the Spanish Inquisition. The collection includes a portrait of Augusta Furtado, who, in the 17th century was prominent in the Jewish world and also served twice as the mayor of Bayonne. Other artifacts come from a private 19th century synagogue, and there is a January 19, 1753 document, which is about royal protective orders and purportedly uses the title “Jew” rather than “Portuguese” or “New Christian” for the first time. Ginsberg found a synagogue in the heart of Bayonne, but it was unclear whether or not it was still in use. Neo-classical in style, it was meant to be a shift from private to public worship, with the inscription in Hebrew and French: My house will be marked as a house of prayer for all nations. Since this is also a feature of the Folklife fest, I thought I might add some music based out of Jewish California to the list. 😛 By no means meant to be conclusive, heh. But I cover a variety of bases. Dave Winestone’s The Goldene Medina Klezmer Band! UC Berkeley’s Jewish a capella group, Kol Hadov! Jewish punk rock with Gefilte F*ck! The Smithsonian Folklife Festival continues until July 10. Check out my past coverage of Jewish life in unique places under the “Annual Events” tab.